Everyone is talking about Pope Francis. Everywhere I go people tell me how much they love the Holy Father, how inspired they are by his example, and what renewed interest in the faith they and their friends are experiencing. As we approach the first anniversary of Pope Francis’ election, I can attest that he has given fresh energy and joy to my ministry. All of this prompted me to suggest a symposium on what can be called “The Francis Factor.” It will be held March 18 at Loyola University Maryland. Pope Francis’ words and the power of his example reach us in many ways, including social media. When the pope tweets the world twitters! But he is also a prolific reader and writer. Last November, for example, he appealed to us to open our hearts and minds to the joy of the Gospel. He did so in a document that is more than 200 pages long. Many people have read it, as Pope Francis is very readable, but I’m going to guess that others haven’t. So my next several columns for the Review will offer my own version of “CliffsNotes” for each of the chapters in his exhortation. 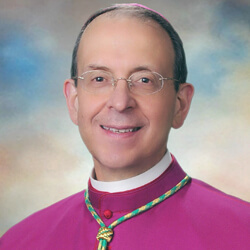 I’m doing this for two reasons: It will help me, as your archbishop, to better take to heart what the pope is saying to us; and second, I think of this exhortation as a kind of roadmap for the New Evangelization which must be at the heart of the renewal we are seeking as the archdiocese enters its 225th year. The pope sets the tone by talking about joy. He doesn’t mean the temporary happiness we feel when we get a raise or win a contest. It’s the joy we experience when we know we’re loved and loved deeply. No one loves us more than Christ. And when we encounter Christ, truly meet him and welcome him into our hearts, we experience a joy that is continually renewed and deepened. This joy is not a mere feeling but a gift of the Holy Spirit. Nor is it optional. It is an essential quality in a follower of Christ and a witness to him. Pope Francis is a realist. He knows that the world we live in does not produce a lot of joy. It’s not that the pope is closed to the world. But as a follower of Christ and as shepherd of the whole church, he knows that self-centered living, which leaves no room for others, leads not to happiness, but emptiness and anger. So Pope Francis is inviting us to a renewed encounter with the Lord. He wants us to be open to the power of his tender mercy which enables us to face ourselves and recover our God-given dignity. He wants us to experience the love that enables us “to lift up our heads and to start anew.” To make this point, he takes us on a whirlwind tour of the Old and New Testaments, showing us how the joy of the Gospel was foretold and how it came to fulfillment in Jesus. “The Gospel,” he says, “radiant with the glory of Christ’s cross, constantly invites us to rejoice.” He helps us see how joy in Christ crucified and risen pervades the whole of the New Testament. This joy is meant for us. He tells us not to be like Christians “whose lives seem like Lent without Easter.” Even in times of suffering, joy in the Lord can not only survive but deepen and grow more beautiful. We need to be reminded that our joy doesn’t depend on having our demands met. It depends on our falling in love with Christ. Once we have done so, then it is our further joy to share the Gospel, to spread its truth, its warmth, its love everywhere. In fact, spreading the Gospel is an imperative for every true disciple. He tells us when we live and spread the Gospel, we live on a higher plane, experiencing true personal fulfillment. For in spreading the Gospel our own encounter with Jesus deepens. By sharing in the mission of the church to spread the Gospel, we live for others. Living for others is the path to deep and lasting joy. Often people ask what’s new about the New Evangelization. Is it a new style of ministry? A new enthusiasm? Yes, to some extent. But the real newness at the heart of evangelization is eternal newness of Christ. His mercies are new each morning. His love does not grow old or weary. When we return to the source, we are renewed. The true newness of evangelization is our openness to God’s initiative. Please pray that the Archdiocese of Baltimore will unite in rejoicing in the newness of Christ as it celebrates this important anniversary year.